Calling all rising 7th-10th graders! Do you love playing with younger children? Interested in building leadership skills and working alongside Team Marbles to spark imagination, discovery and learning? 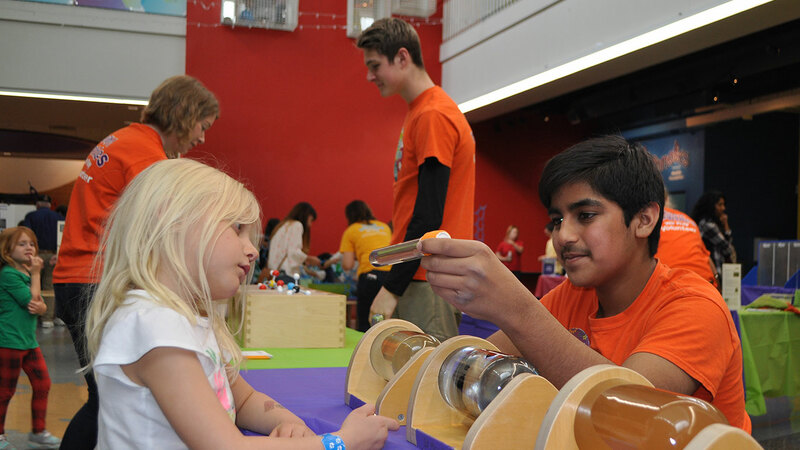 Marbles Teen Play Corps participants playfully engage younger kids in science, art, creativity, physical activity and hands-on learning in Marbles exhibits, programs, camps, events and in the community. The 2019 application period has closed. Current applicants will be notified of selection status in early April. Marbles will accept new applicants beginning January 2020. Click here for the Teen Play Corps application. Click here for the Teen Play Corps recommendation form. Applicants will receive a link to upload an application video in confirmation email. Applicants will be informed of selection status in early April. All Teen Play Corps participants are required to attend one session of Basic Training in May. At Basic Training, participants will get to know each other and Team Marbles, participate in leadership development activities and learn how to lead play the Marbles way. Teen Play Corps participants who are interested in volunteering in summer camps must attend camps training. Commitment Minimum of three weeks. Middle school students may volunteer for half days. High school students may volunteer for full or half days. Morning shift: 8:30am-1pm. Afternoon shift: 12:30-5:15pm. Before Care shift: 8-9am. After Care shift: 5-6pm. Participants may only volunteer for two consecutive weeks. Summer Museum Play Practice - Practice leading play with Marbles campers during Play Practice sessions throughout the summer. Receive coaching and mentoring from Marbles staff. Returning Teen Play Corps members will be offered additional summer volunteer opportunities in the museum. Teen Play Corps participants have lots of ways to play throughout the school year. You're encouraged to volunteer as often as you like and for a minimum of one shift per month. See what current members of our Play Corps have to say about the program.